A truly unique and high quality heart design diamond engagement ring. Diamond Quality: H Color, SI1-SI2 Clarity (available in different diamond quality by request). Available in 0.20 Carat, 0.25 Carat, 0.33 Carat, 0.50 Carat, 0.62 Carat, 0.75 Carat and 1 Carat. Need this setting only without the diamond? Order as a setting only -- without diamond. Also available in Reversed Colors, White Gold, Yellow Gold, 18K Gold, or Platinum by request. 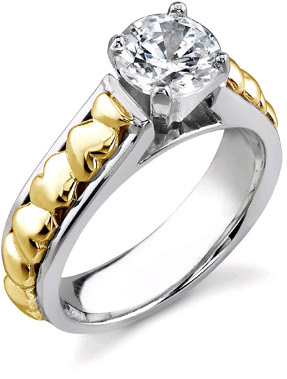 Apples of Gold Jewelry guarantees the Diamond Heart 1/4 Carat Engagement Ring, 14K Two-Tone Gold to be of high quality and an authentic engagement ring with real diamonds, as described above.